You may recall that Canteen are famed for their no nonsense Great British Food policy, which as a great fan of British food is right up my street! After all, that is exactly what they provided when I came here at Christmas for their Turkey Canteen Pie (which featured in our ’12 Pies of Christmas’ music video). Well with Great British Food on the menu and it being British Pie Week, I thought it was about time I headed on down to complete a personal #PiePledge that I had made a while back – long before British Pie Week began: to go for Canteen Double Pie! Yes, with pie on the main menu and dessert menu, this is our idea of Pie-radise! And with the free power sockets and wifi in the restaurant, this is our first pie review of British Pie Week and coming straight from the restaurant! So first, what did I make of the Beef and Tomato Canteen Pie? The first impressions were very good. The pie was so golden and perfectly formed. No boil out or anything wrong. The pie was perhaps a little smaller than I had remembered from my previous visit to Canteen, but having cut it open I could see it was packed to capacity. 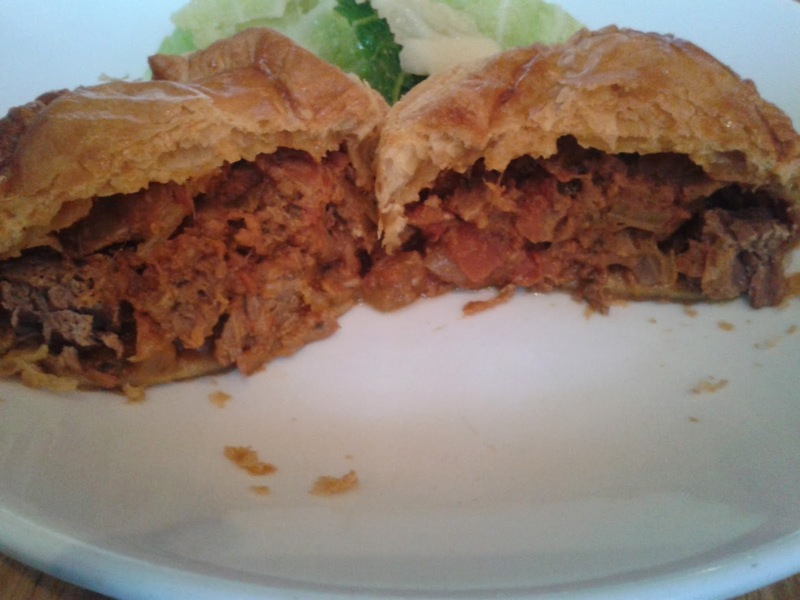 The beef was so lovely and tender, not at all chewy and packed into the pie content. For me this is a crucial part of any meat pie – is the meat good? In addition to the beef, there was a mix of some veg, herbs and spices and the obvious small pieces of tomato, which I would describe as clearly noticeable but not too overpowering in flavour. I think a beef/steak pie with gravy or ale gravy would be slightly preferable, but the tomato does add something different, so I commend Canteen for doing something a bit different. The pie content was therefore very good and complemented the light, crisp top pastry. The side and base pastry was lovely too, though a bit softer. All in all, the balance was pretty good, with a piefectionist suggesting that perhaps a slightly larger pie would mean there was slightly more pastry to perfectly balance the packed capacity of meat, particularly because the pastry is quite thin and light, so there is not so much of it to balance the filling flavour. 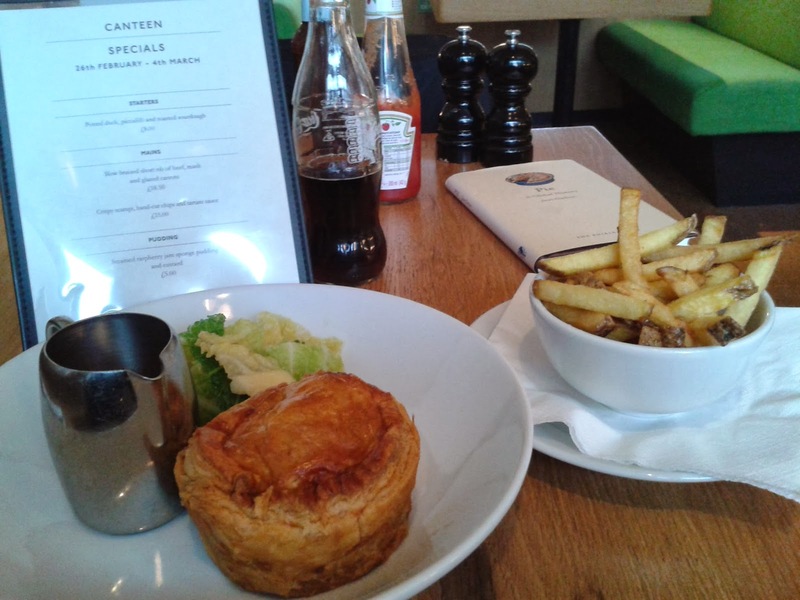 At £13.50 for the pie, chips (or mash) and greens, it is a reasonable expenditure for a pie but when the pies are so good and you’re sitting in central London (Canary Wharf) you can see why. Another Pierate Recommended pie from Canteen! Onto round two of this Double Pie challenge – Apple Pie! As you can see, you just get a slice of a bigger pie and the condition of this wasn’t quite as good as the exquisite meat pie. The colour was still strong but the top pastry had crumpled rather. The pastry was however really nice. Very different to the beef pie in that it was a lot crisper shortcrust, though the inside portion of the crust was softer. It therefore provided a nice crunch upon biting but not dry and off putting. However the apple filling was a bit more mixed. The apple pieces were very big and on the whole tasted fine, but the apple at the edge crust was quite nice and soft (not mushy but just a gentle bite), whereas the centre pieces of apple were far more crunchy and bit too hard. The consistency between the apple pieces could therefore be improved and while nice, they didn’t blow me away with flavour. I ate the first half of the pie without custard and it was a good texture apart from those crunchy apples. The inside of the pie was moist and flavoursome, contrasting the outer pie crust well. 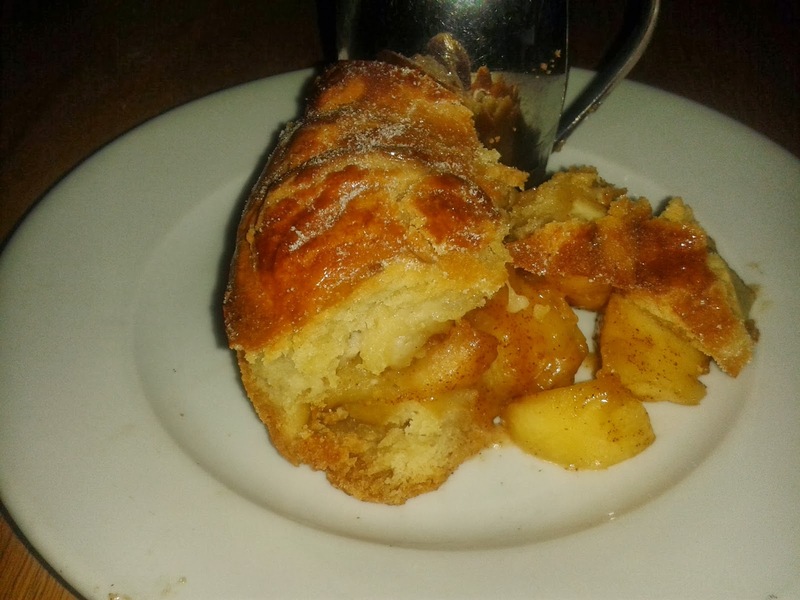 The pieces of apple were probably a bit too big and chunky for the pie crust, and if a little smaller would have probably cooked a bit better and had a more manageable bite to them. The custard did improve the dish and was very pleasant, not overpowering in flavour but complementing the apple pie well. All in all, a decent apple pie, but at £5 for a slice (which could get you several whole apple pies elsewhere) it’s not one I would rush back to eat again.